The profoundness of an intense interpretation combined with a warm velvety sound of finest piano playing. 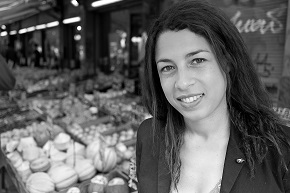 Pianist Celimène Daudet was born in Aix-en-Provence, France, from French and Haitian parents and started with her first piano lessons at the local conservatory. She soon gave first recitals as well as her first performances with orchestra. She studied with Gery Moutier at the Conservatoire National Superieur in Lyon followed by studies for chamber music with Jean Mouillère at the Conservatoire National Superieur de Musique in Paris. Célimène Daudet is a winner of the International Competition Jean Francaix in Paris, the international competition of the FNAPEC “Ensemble Music”, the Val d’Isère International competition and of the Pro Musicis International Prize. She performs as soloist throughout Europe, Asia and North America. In 2013 she gave her Carnegie Hall Debut as well as her debut at the Châtelet Theatre in Paris. Latest engagements include concert performances in Jerusalem, Moscow, Washington, Minneapolis, Kansas City, Beijing, Shanghai, the “La Roque d’Anthéron” festival, the National Opera of Lyon, the Opera d’Avignon, MC2 in Grenoble and the Halles aux grains in Toulouse. Célimène Daudet’s first solo album “A tribute to Bach”, her release of the “Art of Fugue” as well as her latest album featuring Préludes by Messiaen and Debussy have been appraised by the French and foreign press and received numerous awards. She is initiator of the Haïti Piano Project and Artistic Director of the first Haïti Piano Festival. Projects of the last season included concert tours to Brazil, Havanna und Asia, a concert as soloist with the Mulhouse Symphony Orchestra as well as her Debut at the Vienna Konzerthaus. Zu den Projekten der vergangenen Saison zählten Konzertreisen nach Brasilien, Havanna und Asien, ein Konzert als Solistin mit dem Mulhouse Symphonieorchester sowie ihr Debut am Wiener Konzerthaus. Cuurent projects are concert tours through Marocco and China, Solo recitals in Paris, London, Bordeaux, Nantes and Aix-en-Provence as well as a Philip Glass program at thePhilharmonie de Paris. Debussy - Etudes "Pour les cinq doigts", "Pour les tierces"
We will be happy to send you music samples and further information about Célimène Daudet on demand.